Play Zeus 3 Slots | 50 FREE Spins | 192 Ways to WIN! Spin to WIN Zeus 3 slots at Moon Games today! With 192 ways to win, expanding Wilds, nudging Wilds, Scatters, and FREE Spins you’re sure to Win BIG! Terms: Min dep £10, on 1st deposit only. Bonus: 100% up to £500 + 50 Free Spins on Stampede Slots. 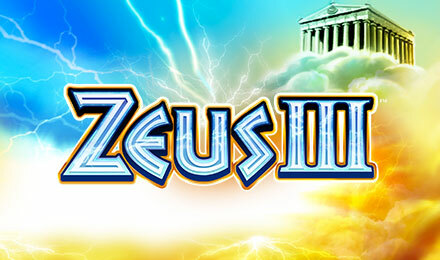 Zeus 3 slots is the latest in the series of the exciting Zeus themed online slots! There is a unique layout with 6 reels increasing in size from left to right. Zeus 3 slots offers and amazing 192 paylines so there are loads of ways to win! If you can get at least 3 Zeus Lightning Bolt symbols you’ll trigger the Free Spins Feature where you can get up to 50 FREE spins. Add card and start winning in big. The Zeus Symbol acts as a stacked wild during free spins to help you get even bigger wins! Play Zeus 3 slots today on Moon Games!